Ordinary tools and basic carpentry skills are all that are required to work with plywood and oriented strand board (OSB) structural panels. 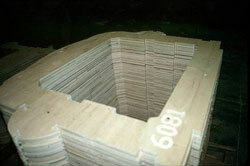 Wood panels can be cut, drilled, routed, jointed, glued and fastened. In addition, panels can be bent to form curved surfaces to a certain extent without affecting the panel structurally. Fabric or plastic materials can be stitched to panels up to 3/8-inch thick with industrial sewing machines. Ultimate-test bond strength values in excess of 100 pounds per linear inch have been achieved with fabrics stitched to 1/4-inch thick panels. For best results, use a carbide tipped Alternate Top Bevel (ATB) saw blade with 60 teeth for a 7-1/4 inch blade or 80 teeth for a 10 inch blade. Adjust the blade to extend through the panel at least 1/2 inch. Cutting teeth should enter the face of MDO plywood. Backing the panel with scrap material and feeding it through slowly helps avoid chipping. Thin panels can also be die cut. A high speed drill is recommended. If appearance of the back is important, panels should be backed with scrap material to avoid chipping as the drill breaks through. Drill at least 1/4 inch in from the panel edge. Wood panels can be bent in a radius. The distance of the radii developed by bending the panels is dependent on its thickness, panel type and moisture content. It is easier to bend the panels parallel to the structural axis of the panel than across the grain. The higher the moisture content of the panels, the easier they are to bend. 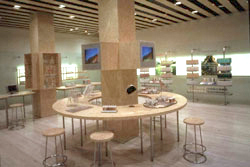 See APA Technical Topic: Bending Plywood, Form TT-003, for additional information. The integrity of an assembly is frequently dependent upon the connections between the components. For maximum strength and stability, each joint requires a design based on the fastener type and the strength properties of the individual assembly components. Commonly used fasteners include nails, staples, bolts, screws and adhesives. Withdrawal strengths for nails and staples depend on many variables including the density of the wood species, the depth of fastener penetration and the type of fastener. For more information see APA Technical Topics Nailhead Pull-Through Strength of Wood Structural Panels, Form TT-070. Fastener head pull-through is dependent on the head diameter, panel thickness and density. For information on pneumatic nails and staples, consult the International Staple, Nail and Tool Association's ICC Evaluation Service Report, ESR-1539. Commonly, structural wood panels are attached to metal with self-drilling and/or self-tapping screws, depending on the thickness. It is important to specify the appropriate fastener length, thereby ensuring that the threaded portion of the shank will engage in the steel framing. 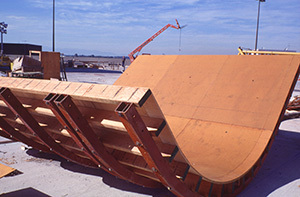 The performance of the plywood/metal connection is dependent upon the strength properties of the plywood, the shear value of the screw and the withdrawal resistance between the screw head and the metal. See APA technical publications Fastener Loads for Plywood – Screws, Form E830 and Screw Withdrawal from the Face of APA-Trademarked Structural Panels, Form TT-051, for additional information. The performance of wood panel and metal connections is dependent upon the compressive strength properties of the plywood and the tensile yield strength of the metal fastener. For specific information regarding the design of bolted connections of wood panels, see APA Technical Note: Fastener Loads for Plywood Bolts, Form E825. There are many adhesive types on the market with characteristics that lend themselves to different types of fabrication with wood panels. The choice of adhesive depends upon the needs of the production. A structural adhesive is expected to produce a rigid joint and therefore must supply both stiffness and strength to the assembly. The strength requirement is generally such that the adhesive must be as strong or stronger than the wood it bonds. Structural adhesives often require the mixing of two components and pressure and elevated temperatures to cure. A semi-structural adhesive may be assumed to supply stiffness only. Adhesives are characterized by assembly times and temperature required to cure them. More information about adhesives and wood panels can be found in APA Technical Note: Structural Adhesives for Plywood-Lumber Assemblies, Form Y391.